This special Thai fried rice recipe is simple to make and so delicious! It can be served either as a side dish or full course meal and makes a terrific addition to any dinner party or potluck. 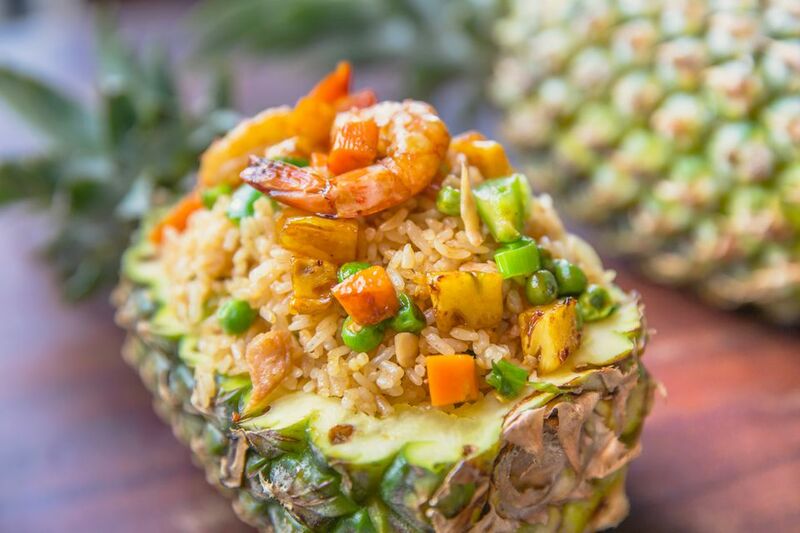 This special fried rice includes juicy pineapple and plump shrimp or prawns in addition to vegetables, plus a touch of sweetness (currants or raisins) and crunch (cashews) for a taste sensation in every bite. This is one of the signature dishes of Thailand, often served on a pretty platter or in a carved-out pineapple. It's a true crowd-pleaser and is sure to be a hit at your table. If using old rice, oil your fingers with up to 1 tablespoon vegetable oil, then work through the rice with your hands, separating any chunks back into grains. Set aside. Combine stir-fry sauce ingredients (fish sauce, soy sauce, curry powder, and sugar) together in a cup, stirring to dissolve. Set aside. Heat a wok/large frying pan over medium-high heat. Add 2 tablespoons vegetable oil and swirl around, then add shallots, garlic, and chili, stir-frying 1 minute. Add bell pepper, if using, plus 1 to 2 tablespoons chicken stock. Stir-fry 1 to 2 minutes. Add the shrimp plus chicken stock, 1 to 2 tablespoons. at a time, enough to keep ingredients sizzling. Stir-fry until shrimp turn pink and plump (2 to 3 minutes). Push ingredients aside and crack the egg into the pan, stirring quickly to cook (like making scrambled eggs). Now add the rice, pineapple chunks, peas, and currants/raisins. Drizzle stir-fry sauce mixture over and gently stir-fry to combine over medium-high to high heat. You want the rice to "dance" (make popping sounds) as it fries (5 to 10 minutes), or until rice has achieved desired lightness. Toward the end of this cooking time, add the cashews. Taste-test for salt/flavor, adding more fish sauce until desired taste is achieved. To serve, scoop rice onto a serving platter or in a carved-out pineapple boat if serving at a party. Top with spring onions and enjoy. Always scrape from the bottom of the pan as you fry, gently turning or tossing the rice. Avoid adding any more stock, or your rice will become heavy. You want the pan hot and dry at this point. However, you can push ingredients aside and add a little more oil to the pan/wok (this provides that special 'shine' you see in restaurant fried rice).